Climate change is mainly caused by emissions of CO2 from burning fossil fuels, which provides over 85% of the world’s energy. 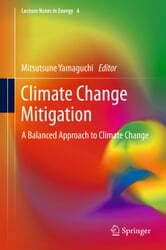 Strategies for mitigating climate change are connected with handling economic and social activities through their effects on the use of energy. Climate Change Mitigation investigates the costs of mitigation measures in comparison to their benefits, and compares the effects of implementing mitigation measures on various areas such as energy security and energy economy.